Sakaue Toshié was born on August 14, 1925, into a family of tenant farmers and day laborers in the hamlet of Kosugi. The world she entered was one of hard labor, poverty, dirt, disease, and frequent early death. By the 1970s, that rural world had changed almost beyond recognition. Toshié is the story of that extraordinary transformation as witnessed and experienced by Toshié herself. A sweeping social history of the Japanese countryside in its twentieth-century transition from "peasant" to "consumer" society, the book is also a richly textured account of the life of one village woman and her community caught up in the inexorable march of historical events. 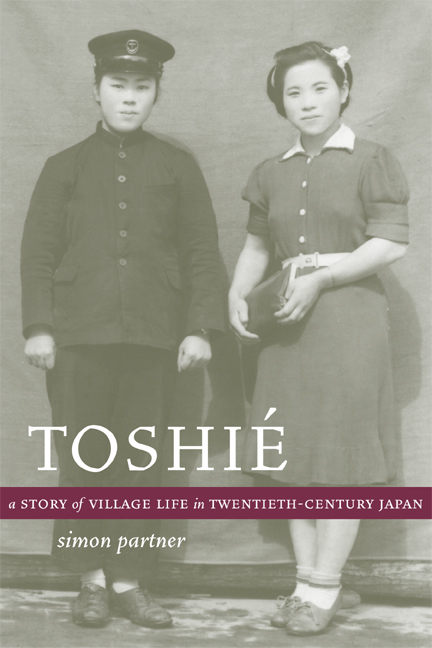 Through the lens of Toshié's life, Simon Partner shows us the realities of rural Japanese life during the 1930s depression; daily existence under the wartime regime of "spiritual mobilization"; the land reform and its consequences during occupation; and the rapid emergence of a consumer culture against the background of agricultural mechanization during the 1950s and 1960s. In some ways representative and in other ways unique, Toshié's narrative raises questions about conventional frameworks of twentieth-century Japanese history, and about the place of individual agency and choice in an era often seen as dominated by the impersonal forces of modernity: technology, state power, and capitalism. Simon Partner is Associate Professor of Japanese History at Duke University. He is the author of Assembled in Japan: Electrical Goods and the Making of the Japanese Consumer (California, 1999).